Handmade Harbour: Giveaway and Special Offer! Over on 1st Unique Gifts, I have a giveaway going on! 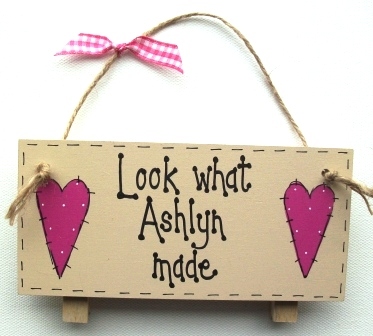 I'm giving away a personalised art hanger and it's easy to take part - for your chance to win one of these to hang up your child's mini-masterpieces, just leave a comment on this post on 1st Unique gifts blog. Meanwhile, the art hangers have a special offer going on too! You can buy (all different if you like and all personalised) four art hangers for less than the price of three. The offer and giveaway are UK-only (sorry to my overseas readers - I'll do a giveaway for you soon!). It's a great way to stock up on children's presents (they make great gifts for your kids' friends) or even Christmas presents (is it too early to say that? I know some people have already started their Christmas shopping!). Think about grandparents as well as Mums and Dads - personalised art hangers make a lovely little gift from a child they love! It won't be hard to think of four recipients for these cute masterpiece-holders! I just thought I'd mention the giveaway and special offer over here too, as I know a lot of Handmade Harbour readers like to encourage their children to make, too. It's not always all about the grown-ups!